Local planning policies are set out in the development plan for each of the 25 local planning authority areas in Wales. If your local authority or national park authority has ‘adopted’ (approved) a development plan, you should know about the policies in it because they have an effect on planning decisions in your area. National planning policy is more likely to be relevant if proposals are very large, or if the development plan was adopted many years ago and is now out-of-date. The two main types of development plan are Unitary Development Plans and Local Development Plans. Since 2004 each local planning authority in Wales has been required to produce a new-style Local Development Plan (or ‘LDP’). The LDP is shorter and more concise and should take less time to prepare. The LDP sets out each local planning authority’s proposals for future development and use of land in their area. The LDP will gradually replace Unitary Development Plans. Once the LDP is adopted, it will form the basis of planning decisions that the local planning authority makes. Where possible, the LDP should link in with the aims of the local Community Strategy or, in National Park areas, the National Park Management Plan. Most local authorities are currently in the process of preparing their Local Development Plan and are at different stages in the process. The LDP can be used to decide planning applications, even while it is being prepared, as it states what the council’s future plans are for the area. The closer the planning authority is to finishing the Local Development Plan, the more weight it has in planning permission decisions. The LDP encourages greater public involvement in plan-making than was the case with UDPs. Authorities should try to engage their communities during the very early stages of plan-making, and to consult the public at later stages (this is usually called ‘public consultation’). The aim of this is to reduce disagreements about later stages of the plan and to reassure people of where development is likely to occur in their area. The aim of this stage is to identify the main issues and objectives to be addressed in the Local Development Plan, and to establish the information which is needed to prepare a good plan. This is called the ‘evidence base’. Developing this evidence base is a continuous process. In order to achieve a ‘sound’ plan, your authority will collect a wide range of economic, social, and environmental information to provide a factual base for the plan. For example, information on an area’s existing housing stock will be collected and compared against future demand for housing. This will help to decide how much new housing will be needed over the plan period. The LDP needs to encourage development that is economically, socially and environmentally sustainable. A Sustainability Appraisal Reportwill show how this has been considered. Your local authority may ask you and your community or local organisation for information about your area. Members of the local community and organisations can help develop the evidence base by providing detailed information about their area which the planning authority may not already know about. This might be the things that you think make the area special, or particular sites which you think should be considered for future development. 1) A timetable for producing the plan, indicating when each stage of the preparation process will happen. 2) A ‘Community Involvement Scheme’, which explains how and when the authority will involve ‘stakeholders’ and the local community in the plan-making process. 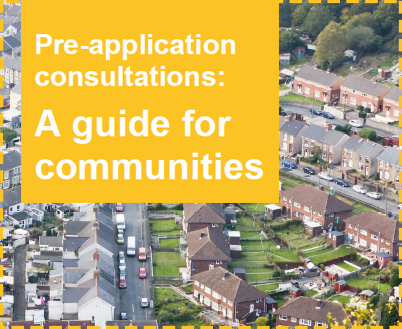 Once agreed, the Delivery Agreement commits the local authority to producing its LDP according to the stated timetable and using the consultation methods described in the Community Involvement Scheme. If the authority does not keep to the timetable, it needs to agree a new timetable with the Assembly Government. If the authority does not do what it says it will do in the Community Involvement Scheme, this will be taken into account by the independent Inspector who looks at the final plan to see whether it is ‘sound’. The regulations governing LDP preparation mean that planning authorities must consult with a range of organisations about their plans before the Delivery Agreement is signed. Authorities have some flexibility in how they do this consultation, but there are some groups of people and organisations which must be consulted. For more information on this, click here. Once agreed the Delivery Agreement is available for anyone to look at, either by visiting your local authority offices or on the authority’s website. Once information and evidence has been gathered and the objectives for the plan have been set, planning authorities work with ‘stakeholder’ organisations and local communities to develop a range of future options for the plan area. These are considered to see which option, or combination of options, are most appropriate for the plan area. Planning authorities have choices as to how they work with communities at this stage. Some work closely with local communities at this early stage of plan-making, because they believe the final plan will enjoy more public confidence. Other authorities do not expend as much effort to draw local people into generating and selecting options, believing that it will slow down the plan preparation process. After considering broad options, a Pre-Deposit Local Development Plan is then prepared by the planning authority. This goes out for public consultation for a minimum period of six weeks. It is not a full draft version of the plan, but sets out the authority’s overall objectives for the plan and the ‘preferred strategy’ for growth or change over the plan period. This preferred strategy will usually include options for major development sites. During the consultation period, local communities and stakeholder organisations are invited to give their views on the pre-deposit plan. Responses to the consultation can influence the preferred strategy, by suggesting modifications or alternatives, providing they are compatible with the LDP’s main objectives. At this stage, planning authorities should consider whether the plan strategy is ‘sound’. For more information on what makes a plan ‘sound’, click on ‘Examination’ in the left hand menu. Also, landowners, developers and members of the public can suggest at this stage ‘candidate sites’ for possible inclusion in the ‘deposit’ version LDP. This is the probably the most important stage for you and your community if you want to influence the plan. Anyone can submit their views to the planning authority during the consultation period. However, you do need to make sure that your views are sent in, either by post or email, using the relevant form. Consultation on the pre-deposit local development plan lasts for a minimum period of six weeks. During this time, the plan and related documents can be viewed either at the council planning offices or on its website. At the end of the consultation period, the council draws together all the contributions received (known as ‘representations’) and writes a report explaining what it intends to do about them. After the pre-deposit consultation period, the planning authority works to prepare a final ‘Deposit Plan’. This is a full draft version of the Local Development Plan, which is based on the evidence and information gathered and the community’s response to the pre-deposit Local Development Plan. other specific policies and proposals. The deposit plan is accompanied by a consultation report, which describes all the comments received during the pre-deposit consultation period and how they have influenced the authority’s preparation of the deposit plan. Once the Local Development Plan is placed on ‘deposit’ with the Welsh Assembly Government, the planning authority cannot change it. Any changes to the plan from this point onwards can only be made by the independent Inspector who will examine the plan. Once the plan is placed on deposit, there is a further public consultation for a minimum period of six weeks. During this time, members of the public can make comments about any aspect of the deposit plan. Comments may either be in support of the plan or objecting to it. If you object to the deposit plan, you need to explain why the plan should be changed, and if possible you should provide reasons for your objections and supporting evidence. You can suggest alternative sites for future development, or that settlement development boundaries are changed. However, any changes you propose will need to fit in with the preferred strategy, and you will also need to show that any new development sites are in line with the Sustainability Appraisal.This is why it is important to come forward with proposals at the earlier pre-deposit stage of plan preparation, when these tests are carried out by the planning authority. Copies of the Deposit Plan will be available at your local authority’s planning offices and on its website. After the public consultation on the Deposit Plan, the plan and all its accompanying documents are handed on to the Planning Inspectorate for ‘examination’ by an independent Inspector. The independent Inspector will look at the submitted plan and consider how it performs against ten ‘tests of soundness’ – a summary of these tests of soundness can be seen by clicking here. To do this, the Inspector holds an Examination to look at all the evidence available, all the representations made (these are summarised in the Consultation Report), and the particular circumstances of the Local Development Plan area. The Inspector also considers the soundness of the Local Development Plan by looking at the Sustainability Appraisal. Members of the public are able to take part in the examination of the plan at the discretion of the Inspector. After the Examination, the Inspector writes a report which is ‘binding’ on the planning authority. This means that, unless the Assembly Government intervenes, the planning authority must accept the changes required by the Inspector and adopt the LDP as amended. This gives the Inspector a more important role in plan-making than was the case with Unitary Development Plans. The Inspector aims, wherever possible, to get the Local Development Plan to the stage where it is sound and can be safely adopted. If the plan is obviously unsound, the inspector can recommend that it is withdrawn. However, assuming that soundnesschecks have been made before submission, this is very unlikely to happen. At least six weeks before the examination begins, the planning authority should contact everyone who made arepresentation to offer them the chance to give their views in writing or, if objecting, to do so in person at the examination. The independent inspector will hold a pre-examination meeting to identify the issues to be discussed and the format of the examination, and may also hold subsequent programming and agenda-setting meetings. You may attend and listen to the examination, even if you are not taking part in it or have not made a representation. The inspector can also invite certain members of the public to speak and provide evidence to make sure that the plan is sound. Once the Inspector’s report is published, the Local Development Plan must be ‘adopted’ by the planning authority within eight weeks. When the Plan is adopted, the planning authority publishes an ‘Adoption Statement’ to say so. All these documents should also be available on the authority’s website and in its planning offices. Once adopted, anyone can seek to challenge the Plan in the High Court so long as the challenge is made within six weeks of adoption. Once the plan has been adopted it is monitored every year through an Annual Monitoring Report. There will also be a major review of the LDP every four years. To find out which stage your local planning authority is at in preparing a Local Development Plan for your area, please visit our local planning authority pages.